Bassist Jeff Andrews has died, aged 58. I remember, decades ago, hearing the word “swunk” (a combination of “swing” and “funk”) for the first time. It was from Jeff Andrews who was describing the feel of Jaco’s playing on The Dry Cleaner From Des Moines from Joni Mitchell’s album Mingus. I was lucky to have met Jeff a couple of times, at guitar shows where we were giving clinics (not much more than a handshake and “good to meet you”). Luckier still was when he and Mike Stern stole off to a quiet side room and played for over an hour to the handful of us who were fortunate to have been in the right place at the right time. Included were a sprawling, unapologetic version of Giant Steps, and a delicate version of Softly, As In A Morning Sunrise that I’m still unable to forget. Many already know about Jeff’s incredible playing and musicianship, but I wish it were more. All a work in progress. I haven’t found anything to indicate that the factory would have been open during the overnight hours. Pencil-making by lamplight? It would be the 1880s before factories of any kind were lit by electric light. Chemical-soaked rags? If so, how long would it take for a fire to start? I have no idea. Good thing they had plenty of…insurance. I have always found it amazing that the company was up and running at its new location in Greenpoint less than 3 months after the fire. Then again, how much did the operation depend on machinery, bespoke or otherwise, at that time? Also, it wasn’t said whether they were running at capacity from the start. His new factory was “already secured”, two days after the fire? To be clear, I have never owned, operated, designed, or otherwise managed a pencil factory, but that still seems like an extraordinarily quick turnaround. Maybe it’s just a little bit of hyperbole—something to express a sense of business-as-usual to reassure employees (and stave off competitors)? Perhaps a move had already been in the planning before this terrible ‘accident’ occurred? “Rough draft” might be too generous. It’s more like a “rough compilation”—396 pages so far, with at least as many to go. This copy is a one-off. The original patent for attaching an eraser by means of a ferrule. A couple of Fabers: Lothar Washington and Eberhard III. Some advertising: I wish I could find an original print of this particular ad. Some reproductions from the 1923 company catalog. Some patent drawings are included, along with photos I’ve taken of the actual objects. Some examples of company graphic design, after many hours of restoration and touch-up. Some of my Blackwing-related photos. The cover art is going to change at some point, but I’m warming up to this design. Tucked away in Tampa’s SoHo district is the city’s only independent stationery store, The Paper Seahorse. I went for my first visit today. There was a large selection of items, arranged in several rooms. One display was devoted to the Traveler’s line, including just about every kind of refill. Pens from all of the usual suspects were available, including Kaweco, Lamy, and Faber-Castell. Plenty of pads and notebooks, including Tomoe River paper, as well as handwriting and calligraphy primers. There were also some hand-turned calligraphy penholders and a large selection of ink. There is quite a bit for typewriter fans, including a typing/writing bar and supplies. The company has a large stock of typewriters for sale. The company also hosts workshops on topics such as calligraphy and hand-lettering. There’s less by way of pencils, vintage or otherwise, but I’ve got plenty already. It’s nice just to see so many items in person that I otherwise have to order by mail—and in Tampa to boot. Graf von Faber-Castell is celebrating 25 years of their Perfect Pencil line with a limited edition, restricted to 750 pieces. There have been many iterations of the Perfect Pencil, many of which you can read about at PencilTalk, but here are a few selections from the catalogs over the years. The dates of the catalogs do not necessarily coincide with the first year each item was offered. This is from the 2006 catalog. Though still offered with a plastic sharpener, the extender would eventually be plated in platinum. A version made of sterling silver was also made available. 2016 would see the inclusion of a magnum Perfect Pencil. The line would be further expanded with models in black and rose gold. The line of replacement pocket pencils was also expanded by including textured surfaces in a variety of colors. Like I mentioned before, this is not a comprehensive list of every Perfect Pencil in the Graf von Faber-Castell range; what began as a revival of a classic pocket-pencil design has grown to a large and diverse collection. I continue to hold out hope though, that the company might reissue the original verlängerer, in stainless steel or in a nickel-plated version perhaps. Caution! A.W. 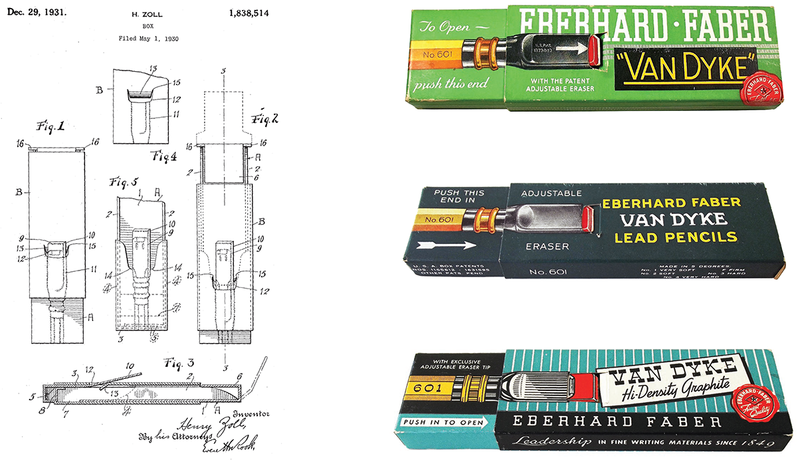 Faber’s Lead Pencils. But, couldn’t they just imitate the counter-stamp, too?